File Types: JPG,PDF,All Files; File Size: 16.8 MB; DPI: 300 DPI. You will be able to download the following digital files after purchase. - 1 Usage Guide PDF PLEASE NOTE: Watermarks or text will not appear on the final files for download. The files are 300dpi (high print resolution). For web usage, resize them down to smaller sizes after overlaying your print / product image on the provided frame area. *We encourage you to overlay your logo or shop name text on the final image with your art/design in order to protect the final image from being stolen from your shop. You can use this styled setting image to display your artwork, print, font, image, photo, invitation, or any other graphic by overlaying it on the area provided. Create the illusion of a styled presentation without having to actually photograph multiple products which can get costly in terms of time and materials! Pre-styled stock image is the perfect solution! Use as many times as you want for displaying as many artwork as you want! Buy similar items from our shop for a more consistent image to your shop front. Or contact us for a 'Custom Package' for your shop! - For your personal or business use, by way of displaying your message or artwork or product overlaid on the image provided by MockUpHeaven, or by using the image or a part of it as a graphic element (eg: banner, icon etc.). - No reselling or sharing of the files or any derivative works of the original image. They remain copyright and property of MockUpHeaven by Soumya and Sneha. - Sharing Limits: Please do not share or upload the high-resolution files anywhere. Thank you! 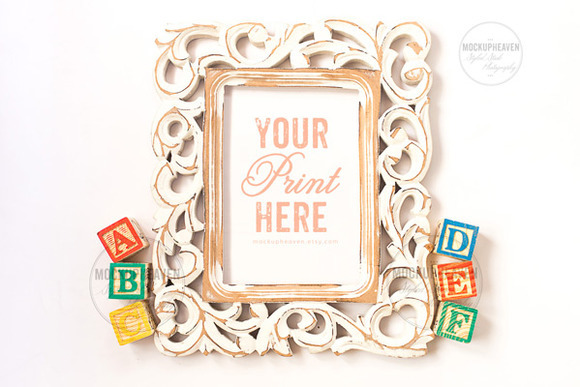 Keywords: styled stock photography, nursery mockup, nursery art print mockup, baby art print mockup, white frame mockup, nursery white frame mockup, colorful nursery mockup, colorful mockup, letter blocks mockup, nursery desktop mockup, kids room mockup, nursery poster mockup, 5x7 white frame mockup, 5x7 white frame stock photo, nursery stock photo, rustic nursery frame mockup, rustic nursery stock photo.